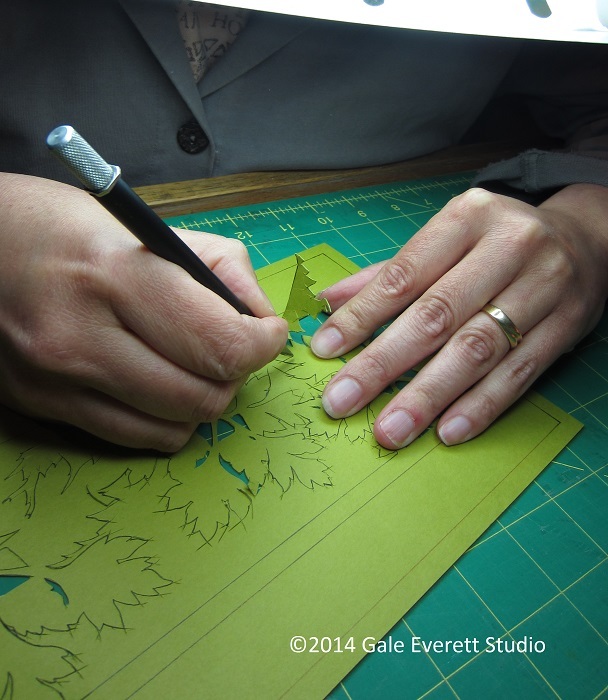 Today, I had my husband take a few shots of me at work on a geranium panel. I don’t have “at work” photos and it’s probably necessary for the new crafty shop opening in Salem. People always like to see how you work and your environment. My current environment is a total looming mess that I probably wouldn’t let a single customer in! I don’t even have friends come over! The last time someone came over was a year ago to pick up their commissioned work. Well, that’s not entirely true since family does come in, but they don’t count! Our household is difficult with challenging dogs. Nuf said. 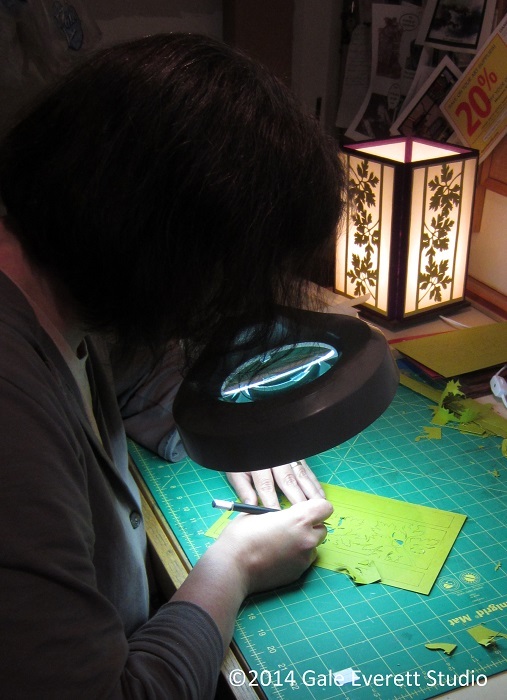 Recently, I acquired the fluorescent magnifier and it’s been the best thing ever! The tight cuts are now visible without my nose to the paper so my back and neck are saved from extra strain. I just have to keep reminding myself to relax. If I’m less tight, then the work (and blades) go more smoothly. Currently I’m using thicker paper and I blow through one blade per panel. Thank goodness they make 100 pks! The downfall of having your hands magnified is you see how many nail and skin problems you have. Or extra glue stuck to your thumb. Beautiful shots. Nice touch having an example in background.